Time to get started on those Christmas cookies! I bake lots of cookies to give as gifts to friends and co-workers this time of year, and it is always a challenge to properly plan the baking and packaging of all of it. I don't have a lot of free time this time of the year (I am sure I am not unique here either). I can't bake them all at one time, so I bake them in stages. 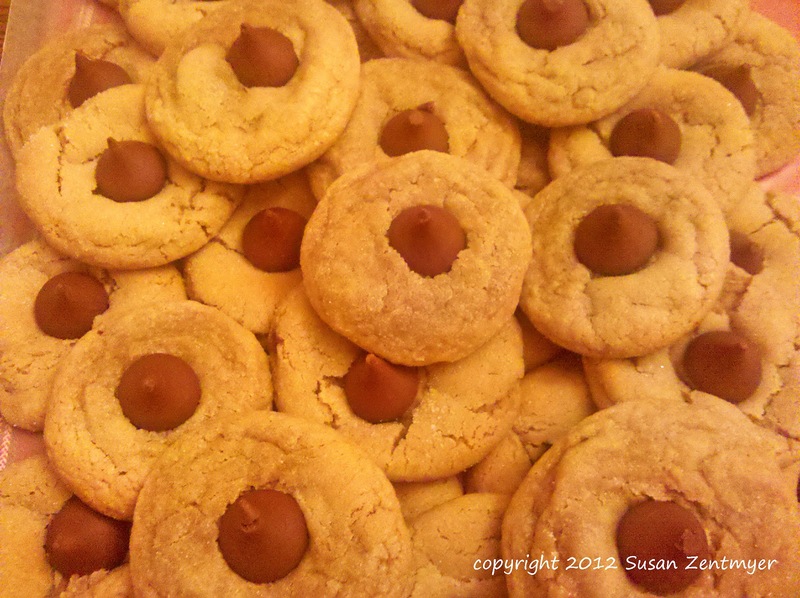 These Peanut Butter Blossoms store really well, so I like to bake these first. Cream sugars, butter and peanut butter. Beat in eggs, milk, and vanilla. Sift flour, baking soda, and salt. Add to peanut butter mixture and mix well. Roll into balls and roll in sugar. Bake on ungreased cookie sheets for 8 to 10 minutes. Take cookies out and press candy kisses in the center of each cookie and bake for another 1 to 2 minutes. Cool on wire rack. Chocolate, peanut butter, cookie... How can this not be good? Yum!